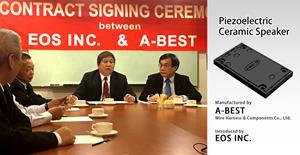 TAIPEI, Taiwan, Dec. 05, 2018 (GLOBE NEWSWIRE) — On November 30th, EOS INC. signed a valuable contract with A-Best Company, a leading manufacturer of advanced Piezoelectric Ceramic Speakers, and started to march toward global 3C market. The collaboration contract was signed by Mr. Yang He-Hsiang, the president of EOS INC., and Mr. Lai Ying-Min, the president of A-Best Wire Harness & Components Co., Ltd., at Gloria Prince Hotel in Taipei, Taiwan. The collaboration signed by Mr. Yang (EOS INC.) and Mr. Lai (A-Best). This collaboration is focused on promoting A-Best’s patented products, Piezoelectric Ceramic Speakers, and developing more value added products to the global 3C market. This innovative and unique ceramic speaker manufacturing technology has been patented by the United States, Taiwan and China. Through its thin, shockproof and waterproof shell, it can produce amazing surround sound with minimal power consumption. Its performance far exceeds that of existing mobile phone speakers. Its prototype products are being trialed by many leading mobile phone manufacturers for their new generation products. Mr. Yang He-Hsiang said that EOS INC., as a formal partner, is very proud and excited about the collaboration with A-BEST. He predicted that in the second quarter of 2019, A-BEST ceramic speakers could be formally ordered and produced. In the near future, the affiliated companies of EOS Group will actively use A-BEST ceramic speakers to develop more value added 3C consumer products, including: children’s audio books, language learning materials, AR and VR interactive products and hearing aid products as well. Mr. Yang also said at the signing ceremony: We have got “a best speaker” for us today. It announces our new success with booming clarity and broadcasts our positive message of always driving forward, around the world. It is expected that these new products will radically increase the global performance and scope of EOS INC. and A-Best Ltd.
EOS Inc. (OTC:EOSS) is a holding company registered in Nevada, USA, that has a vast distribution network and associations with many specialized companies that provide health care, beauty care, and environmentally friendly cleaning products in Asia. Since the first quarter of 2017, EOS Inc. has aggressively expanded its marketing channels in China and Southeast Asian countries. Its products are already positively positioned in these markets and the opening of the flagship stores in Nanning and Foshan was another new milestone. Accordingly, after the flagship stores opened in Singapore, the associate EOS sales teams in Malaysia, Indonesia, Thailand, and Cambodia also continued to make strong moves, aggressively working within the market. On May 3rd, 2017, EOS Inc. acquired Emperor Star trading company in Taipei, Taiwan to strengthen their business and prepare for the challenge of OBOR development in the aforementioned areas. Statements made in this press release are forward-looking and are made pursuant to the safe harbor provisions of the Securities Litigation Reform Act of 1995. Risk factors that could cause actual results to differ materially from those projected in forward-looking statements include, but are not limited to, general business conditions, managing growth, and political and other business risks. All forward-looking statements are expressly qualified in their entirety by this paragraph and the risks and other factors detailed in EOS Inc.’s reports filed with the Securities and Exchange Commission. EOS INC. undertakes no duty to update these forward-looking statements.